The regulated power supply circuit is straightforward and employs an LM317 3-Terminal Adjustable Regulator IC. Parts values suggested are suited to power a stereo version of this design. 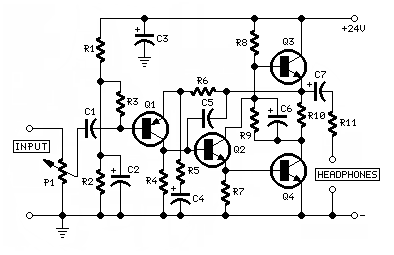 Total current drawing of each amplifier is about 100mA and should not require adjustment. Use small, U-shaped heatsinks for Q3 and Q4. A similar heatsink could be used also for IC1, though in most cases it is not necessary.